To provide increased housing opportunities, Homeless Solutions, Inc. (HSI) set out to develop affordable-housing choices for 12 moderate-, low- and very- low-income families in a transit-friendly location. While affordable housing is often met with reservations, especially in an affluent market like Morris County, HSI used an open process and sensitivity toward the neighborhood to put forward a successful affordable- housing infill project, the largest single infusion of affordable rental housing in Morristown in decades. Morristown, known for its strong socioeconomic profile, has recently experienced a boom in rental and condo redevelopment projects that have catered primarily to higher-end users. In the Second Ward, however, where the Abbett Avenue Apartments are located, housing affordability has become a particularly pressing issue for residents. With no municipal housing plan in place to address this issue, HSI, whose mission is to develop high-quality affordable housing and to provide supportive services for low- and moderate-income people, purchased the property with its own funds. A key factor in HSI’s decision was the parcel’s excellent location within walking distance of Morristown’s downtown, near jobs, amenities, various bus lines and the train station. To ensure that the development had community support, HSI reached out to local officials, hosted two community meetings and met twice with a local neighborhood organization, as well as with a representative of the local historic commission. HSI modified the design as a result of this input to be sensitive to the neighborhood character and to serve as a transition from the adjacent non-residential zone into the lower-density residential area. Streetscape improvements and a crosswalk will provide safe pedestrian access to Abbett Park across the street, and a new sidewalk will improve the Patriots Path regional trail system. The NJ ENERGY STAR building also strives to be energy efficient and, in fact, exceeds requirements of the state’s Affordable Green Building Program. Abbett Avenue Apartments will consist of 12 apartments, evenly divided into one-bedroom, two-bedroom and three-bedroom units and available to very-low-income (30% or less of median household income), low-income (50% or less) and moderate-income families (80% or less). The primary funding source for the project, which cost approximately $3 million, are Low-Income Housing Tax Credits, which give incentives for the utilization of private equity in the development of affordable housing and provide a reduction in a taxpayer’s federal income tax. Major support also came from other funders, chiefly the Morris County HOME program, William E. Simon Foundation and the United Way of Morris County. HSI has committed to provide supportive services to its tenants. It will have a community outreach specialist to provide direct services and referrals to residents; linkages to local licensed day care providers who will commit slots to tenants; the Life Skills Curriculum, a program designed to assist residents with budgeting, credit counseling and other financial matters; parenting; general health issues, education and job search; health care opportunities; and free emergency transportation services to tenants for medical, job search or HSI educational programs, among others. Over one hundred people have already expressed an interest in receiving an application to take up residence in the Abbett Avenue Apartments. Community outreach events will inform the community about the project, the opportunities and requirements. The final tenants will be determined using a lottery system, and occupancy is anticipated in August 2008. 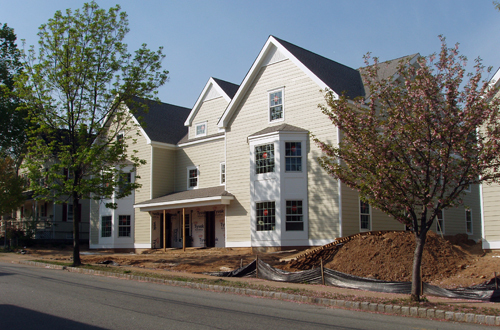 Additional project contributors: Morris County Community Development Division; New Jersey Housing & Mortgage Finance Agency; The Reinvestment Fund; TD Banknorth; William Hotz Development Group, Inc.